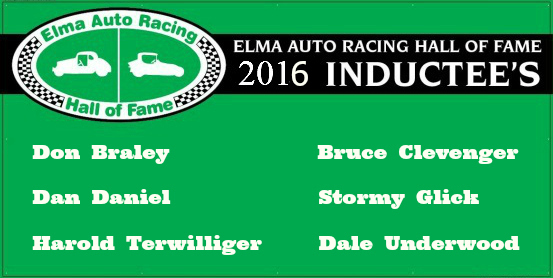 (Elma, WA, February 16, 2016)......The six newest members of the Elma Auto Racing Hall of Fame, ranging from the man instrumental in bringing the Evergreen Stock Car Association to the Grays Harbor Fairgrounds to race winning drivers and track supporters has been announced by the EARHoF. Harold Terwilliger, Stormy Glick, Bruce Clevenger, Don Braley, Dan Daniel, and Dale Underwood will officially enter the EARHoF during the 8th Annual EARHoF Induction Ceremony on Saturday, March 26th. As president of the Evergreen Stock car Association Harold Terwilliger who resided in Montesano guided the group of racers in their infancy and signed the contracts that would move the races from the dust prone Evergreen Speedway on Clemons Hill to the ½ mile oval in Elma in 1957. Terwilliger will receive his recognition posthumously. Longtime track supporter Stormy Glick of Elma can claim driving, car owning, sponsoring, and officiating among his many racing activities over a career that stretches more than 30 years. Glick’s support continues to be a vital element at the track today. One might say Montesano’s Bruce Clevenger grew up at the race track. Clevenger’s dad Harold, a 2010 EARHoF Inductee was one of the original members of the Evergreen Stock Car Association. Bruce Clevenger became a successful limited modified racer in the 1980s and also served as an EARA officier and did track prep. East Olympia supplied the Elma track with numerous competitors and amongst those is Don Braley. Starting in the jalopy class in the 1960s, Braley became a top competitor in the class and eventually also raced in the limited modifieds. 1983 Hobby Stock Rookie of the Year, Dan Daniel went on to win the 1986 Hobby Stock Championship. His number 3 from McCleary was always a top runner and crowd favorite no matter if it was in the hobby stock or super stock divisions. Known as the “Kamakazi Kid”, Aberdeen’s Dale Underwood began racing in the early ‘70s in the limited modified division. Underwood raced until the early 2000's driving super stocks, hobby stocks and the current modified class. The 2016 EARHoF Induction Ceremony will be held at the Stay Beyond Inn & Suites in Elma, on Saturday, March 26th. A silent auction and social hour get the evenings activities started at 6 P.M. with the Induction Ceremony beginning at 7 P.M. Admission is $5 which includes silent auction number, hors d’ oeuvres, punch, and cake. Northwest racing legend Jerry Day will be the keynote speaker and Phil Martelli will emcee the activies. The evening will conclude with a dessert auction and social hour. The Elma Auto Racing Hall of Fame is a 100% volunteer non-profit established to honor and preserve the auto racing heritage of Grays Harbor Raceway. Congrats to the 2016 Inductee's. Well deserved group.